Pros - It's cheap and does a decent job. Sold under a huge number of brand names (and non-brands) a cheap stone is better than no stone. Cons - This wasn't the crispest crust, if that's what you're after, and many cheap stones are more prone to breaking than their more expensive counterparts. Comments - For the occasional pizza-baker, a cheap stone could be a good buy. Pros - It's a surface to lay your pizza on, and most people probably have some sort of cookie sheet or other similar surface to use. Cons - This gave me the worst pizza of the entire series. To get close to a brown crust, I cooked the pizza a total of 12 minutes compared to 8 minutes for the rest, but it was still doughy. At 8 minutes, it was unpleasantly pale. With some tweaking of the recipe, method, and cooking time, it might result in a decent pizza. But for this test, it was a clear loser. Comments - Save this one for serving pizza. Pros - Results were similar to the cheap pizza stone, for even less money. Cons - No matter how careful you are, the stones shift around and need to be readjusted occasionally. Also, drips and spills can get through between the tiles and land on the oven floor. If you need to move you oven racks around, it's more annoying to deal with multiple small stones than one large one. Comments - These are a decent option for temporary use while you're shopping for a permanent stone. Pros - Nearly identical results to the single layer of tiles despite the increase in mass. However, having extra tiles gives you the option of putting them on the rack above the pizza. Cons - The same shifting issues as the single tiles, and even more annoying when you need to move oven racks around. Pros - A crisper crust than with the quarry tiles, and more browning. The rectangular stone gives a little more landing space than a round stone, but it's not so large that it would impede airflow in most home ovens. Cons - Like any porous surface, it's not going to stay pretty for long when you start spilling things on it. Comments - One of the better options of the series. No razzle-dazzle, but this is a workhorse of a stone. Pros - Esthetically pleasing, and you can remove it from the oven and cut the pizza and serve on it. The glazed surface can be cleaned with soap and water. This produced the crispest crust of any of the stones. Serving the pizza on the stone kept the pizza hot and kept the crust crisp. Cons - While this was the crispest crust, some people might find it a little too crisp. Comments - this stone has a lot going for it, but before you buy consider whether you prefer the round stone or the rectangular. Pros - using a screen makes transporting the pizza easy. Very inexpensive. Cons - The crust wasn't crisp at all. Some people have reported issues with the crust adhering to the screen during baking. Comments - This falls under the category of "better than nothing." Since there was no stone distributing the heat evenly to the crust, there were very light and very dark areas under the pizza. Screens are popular for reheating pizzas. Pros - Easy transport to the oven. 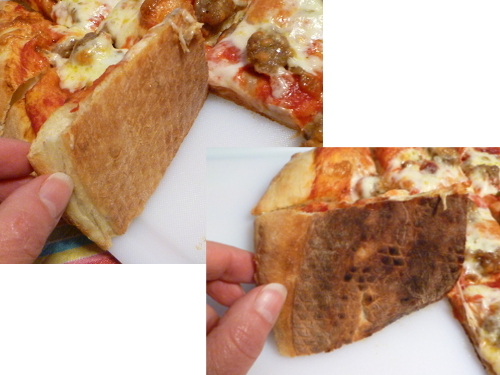 A nicely cooked crust. Cons - If you're looking for a seriously crisp crust, this isn't the way to go. Comments - If you're skittish about getting a pizza off a peel and into the oven, this is an option. You could also move the pizza onto the stone after the crust stiffens up, for direct baking on the stone. Pros - Parchment paper is cheap, and this makes transport to the oven a little easier. Cleanup is easy. 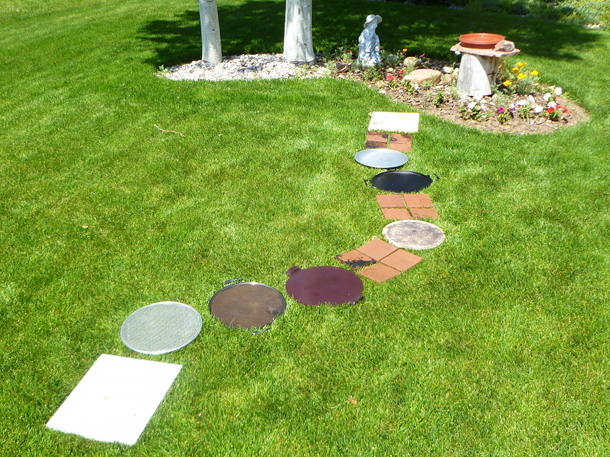 If the parchment is larger than the pizza, drips and spills won't end up on your stone or your oven floor. Cons - The pizza doesn't get quite as crisp as when cooked directly on a stone, but it's close. Comments - The might be the perfect "training wheels" for learning how to move a pizza around. If it's a little clumsy, the pizza will still be fine. I still prefer pizza baked directly on a stone, but some people might prefer this slightly less crisp version. Pros - An almost endless selection of sizes, you can custom-order a stone to fit your oven and your particular needs. The crust was crisp - not as crisp as the Emile Henry, but similar to the King Arthur Flour stone. Cons - There are dire warnings about getting the stone wet. That means cleaning is limited to scraping. Comments - As a bread baker, sometimes I spritz my loaves with water at the beginning of baking. Since this stone has so many warnings about water, I don't think I'd want to use it for those types of breads. If you don't bake bread and this is devoted to pizza, it would be less of a concern. Pros - This can be use on the grill or stovetop, in the oven, and under the broiler. Side handles make it easy to move the stone. The crust was well-browned with spots of char, and crisp. It comes seasoned, but you can opt to season it more. Virtually unbreakable. Cons - Just like any cast iron piece, it has its own cleaning/seasoning rules. However, it's easier to clean than a porous stone. Comments - The versatility of this one earns some bonus points. There's a certain romance to using a stone rather than metal, but this does the job. I thought the slight lip might be a hindrance, but it didn't cause any problems at all. Cons - The metal ring isn't intended for oven use, so it will discolor if you put it in the oven with the stone. This was also the most expensive stone I tested. Comments - While this stone gave the most char, it wasn't the most crisp, which is something to keep in mind. While I'm torn about the usefulness of the metal ring with a hot stone, if you wanted to serve on the stone - hot or cold, it would make it much more useful. And although I haven't tried it, a chilled soapstone would be handy for serving cold items. My ideal pizza may not be the same as yours. In fact, after eating the same pizza recipe (with decidedly different results) every week for twelve weeks, I've come to realize that my ideal pizza is not exactly the same as my husband's. I preferred a crisper crust, while his favorite was slightly less crisp. Most of the surfaces performed well, and after testing surfaces that ranged in price from about $10 to one that was over ten times that amount, there were few pizzas that we were truly disappointed in. Since I tested one recipe on all the stones, it should be said that with recipe and technique tweaks, a baker should be able to get decent performance out of just about any of the surfaces tested. When buying one, though, there are other things to consider, including cleaning instructions, durability and size. There is no single stone that will be perfect for everyone. But everyone should be able to find a stone that is uniquely suited to them. Pizza is very important to me -- thanks for the comprehensive tests! What I do is cook on a cookie sheet for several minutes, then slide it directly on the oven rack. Except for a gravity surge taking away toppings on occasion, it works well. Very cheap, flexible, and it doesn't require preheating. Really nice (if expensive) roundup of so many options. We love our Pampered Chef round stone, although it is a bit thin. But that thing rolled off the top of our fridge and upon landing on the tiled floor, cracked a corner of the floor tile. The pizza stone survived fine! I just received a Lodge cast iron pizza pan (based on your SE posts), and am looking forward to grilling pizza on that sucker. I'd like to know which of all the stones/methods did you personally prefer? Thank you for the extensive testing, your work is greatly appreciated by me. Like you I enjoy a crispy crust, the glazed stone you mentioned has me intrigued. My husband suggested using cast iron skillets that we already own. He also mentioned glazed porcelain floor tile as an option. What is our opinion on such an idea? I'd be a little concerned about glazed tiles, because a lot of glazes contain lead. Floor tiles don't need to be food-safe, so it might be hard to find out the specifications. You could have them tested, I suppose. Cast iron skillets would be fine. The only problem I have with that is that I like to make larger pizzas. But you could have two skillets in the oven and bake two smaller pizzas at once. Thank you for your speedy response. You clarified my hunch about the glaze, which confirms it is a no go for me. I did not mean to post anonymously, I just did not understand how to select a profile as asked. Aw, that's nice! I'm glad you enjoyed the visit! Its porous properties mean that basic care is necessary for the maintenance of a pizza stone. Make sure you don't use a glazed tile, they contain lead, what is very hazardous for your health. Monday nіght iѕ pizza night at our houѕе, with Mom's homemade vegetable pizza at the top of the list of favorites. This annual plant can be grown in an container, and will yield between 1-2 cups of fresh basil. Top the dough with olive oil or cooking spray, and scoop the onion mixture over it evenly.